Around this time of year, my husband gets a bit antsy. No, not about the upcoming Superbowl, but rather for St. Patrick's Day and the opportunity to have his beloved corned beef. He suggested I test out Beer Braised Corned Beef in the Instant Pot and so here we are. The result? Amazing corned beef and I'm especially thankful that it didn't take hours on end to make in my slow cooker. My secret to satisfying my corned beef aficionado is beer... Guinness to be exact! My husband is Irish and is particular about corned beef and Guinness. Having traveled and worked in Belfast, Northern Ireland several times, he's learned to appreciate proper corned beef and Guinness. 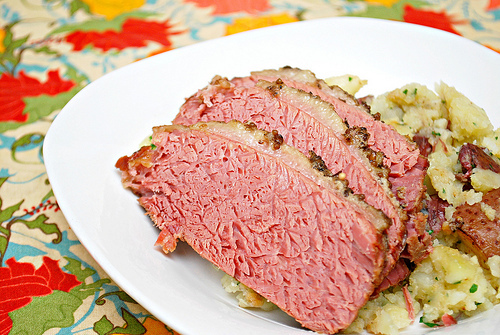 For my corned beef, I use a bottle of Guinness beer to enhance the flavor and some of my favorite corned beef spices. I used to cook this in a crockpot for nearly 12 hours to get it as tender as we like it... but in the Instant Pot, I was able to achieve that same tenderness in less than 2 hours. Below, I note to cook the corned beef under pressure and then allow it to naturally release pressure before a quick release. If at all possible, I recommend allowing the corned beef to completely naturally release pressure with no need for a quick release. Doing so allows the corned beef to stay juicy and there's no worry about steaming up your kitchen! Add the celery, carrots, and onions to the IP. Place corned beef brisket on top. Add beer and enough water to just cover the brisket. Press MANUAL and adjust the time to 110 minutes on HIGH pressure. Once at pressure, the display will reflect 110 (the number of minutes you initially set) and will begin to countdown to 0 minutes. When the IP beeps after pressure cooking for 110 minutes, allow your IP to naturally release pressure for 30 minutes. While naturally releasing pressure (also known as NPR or NR), the display will reflect numbers counting up from 1. The numbers indicate how many minutes the IP has stopped cooking since it beeped (or how many minutes it has been naturally releasing pressure). No need to touch your IP while it naturally releases pressure. When the display reflects 30 (which is 30 minutes since the IP has beeped), turn the setting on top of your IP to VENTING. Doing so allows the IP to quickly release pressure (also known as QPR or QR). I use a wooden spoon to carefully turn the setting to avoid close contact with the potential steam. You may also want to turn your IP away from cabinets to allow the released steam to escape freely. The pin at the top of your IP will drop when all pressure has been released and it's safe to open. * I would also recommend a full natural release if time allows without a QPR. Using tongs, remove the corned beef brisket and slice across the grain; Serve with mustard and horseradish sauce. Pass extra cooking liquid at the table. The vegetables can be discarded.